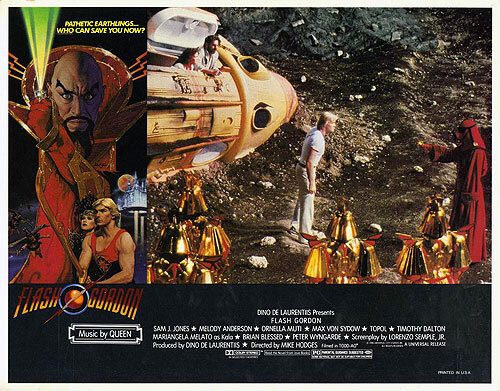 Watching Luigi Cozzi's deliriously over-the-top (and endlessly entertaining) 1978 space opera Starcrash, it's hard to imagine that anything was cut out. 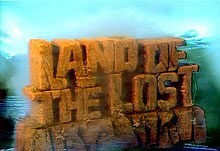 It is simply so jam-packed with action and low budget spectacle, the mind boggles when it's learned that a prominent setpiece was left on the cutting room floor. 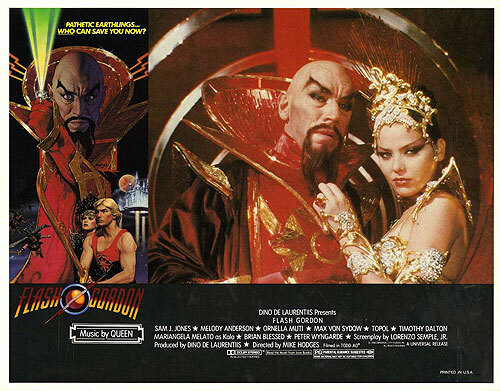 In the finished film, immediately following the curvaceous Stella Star's (Caroline Munro) escape from the Imperial prison, she flees through a marsh-like area where she comes across a spaceship conveniently waiting for her. Originally, though, the scene was to play out with her being pursued by armored guards and falling into a deadly quicksand pit! Another close call for space smuggler Stella! I can't imagine that poor Caroline was pleased to see the scene excised from the finished flick, especially since, from these rare stills, it looks like it was probably a pretty unpleasant couple of day's shooting for the scantily-clad sci-fi siren! 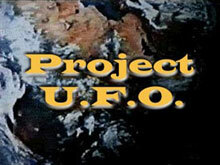 James L. Conway's 1980 UFO conspiracy thriller for Sunn Classics, Hangar 18, was released today on Blu-ray and DVD by Olive Films. 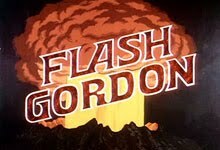 As I've said, I missed it in the theaters when I was a teen, but I do remember seeing these commercials for the movie. They certainly piqued my interest! I kinda adore how the first spot above tries to pass it off as a documentary. Yikes! 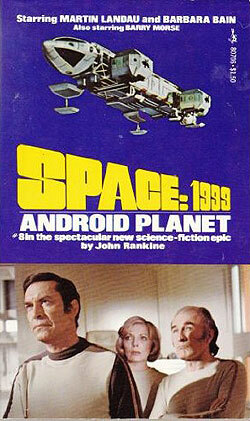 Here's another Space: 1970-era HD release that nearly slipped by me! 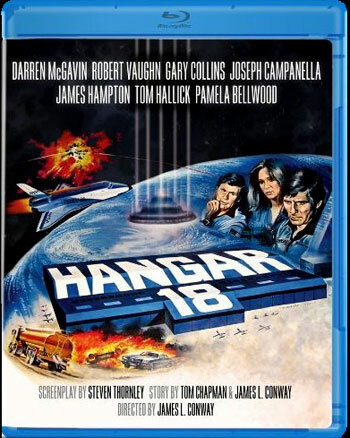 Anyway, the 1980 Sunn Classics UFO conspiracy film, Hangar 18, starring Darren McGavin, Robert Vaughn and Gary Collins, is being released tomorrow on Blu-ray and DVD, courtesy of Olive Films. There's very little info out there on this release, but it does look like it's a new, 1080p HD 1.85:1 widescreen transfer, though no extras are listed. 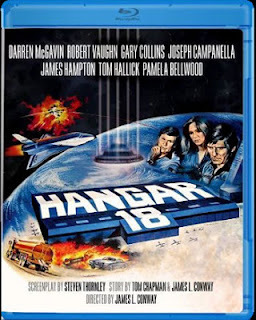 I missed Hangar 18 at the theater in 1980, but I did catch up with it a year or so ago on Netflix Instant. While certainly no Close Encounters Of The Third Kind, with some pretty unimpressive, low budget special effects, it was still an enjoyable flick, due, in no small part, to its familiar cast of professional character actors. Even though this disc - like Olive's other Blu-ray releases - is a little more expensive than I'd like, I still hope to be adding it to my video library soon. It should be in stores tomorrow, or you can order it online from Amazon: Hangar 18 [Blu-ray] or Hangar 18 (DVD). UPDATE: I've now discovered (because I finally went to the Olive Films website!) that this edition includes a bonus feature after all: a commentary track with director James L. Conway (The Boogens) and writer David O'Malley. That sweetens the deal a bit. UPDATE 2: ...or maybe not. The review that appeared today at Blu-ray.com claims there are no bonus features on this disc. I guess I'll have to see for myself once I get my hands on it. UPDATE 3: Having now purchased my own copy, I can confirm that, despite the info on the Olive Films website, the released Blu-ray does not include the promised commentary track, nor any other supplemental features. Oh well. The transfer is very decent, however. There are quite a few specks on the print, but the image is sharp and well-delineated, colors are bright and stable, and the overall presentation is quite satisfactory. If you can find it at a discount (as I did), it's worth picking up. 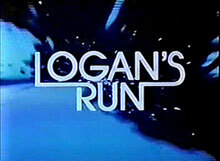 From 1977, here's a long (four and a half minute) promo for the CBS Logan's Run television series, consisting entirely of footage from the premiere episode. In fact, it's pretty much a Reader's Digest-styled condensed version of that pilot film! I'm not entirely certain if this promo was actually broadcast, or was only shown to affiliates and advertisers. 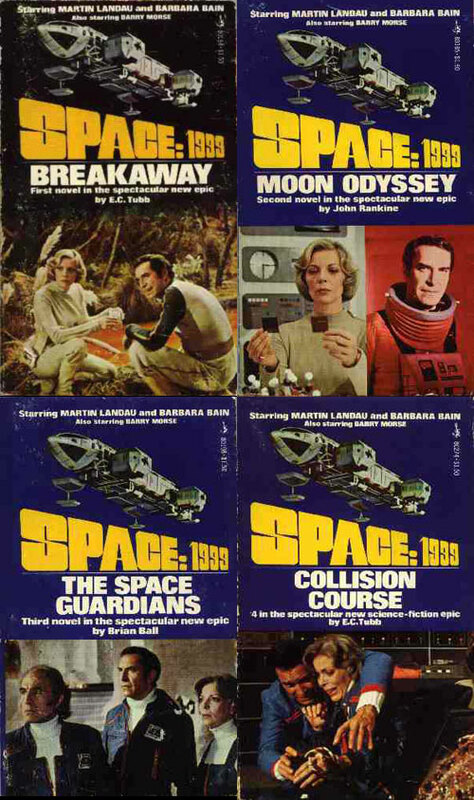 As I noted in my last Captain's bLog, I'm currently working to fill in the gaps in my library of Pocket Books' 70s Space: 1999 paperback novelizations. I've had four of them since I was a kid, but until a week ago, I wasn't sure how many total volumes Pocket had actually published. Turns out that there were ten books published in the U.S. 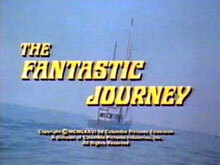 The first six were adaptations of the television scripts, with authors E.C. Tubb, John Rankine and Brian Ball taking three or four TV episodes per volume and linking them together to make a single novel out of them. In the few of these I've read, the authors have done a remarkably good job, seamlessly combining the TV scripts and fleshing them out in imaginative ways. I tend to like Rankine's efforts the best. Starting with book #7, Alien Seed, by Tubb, the series turned to all new, original adventures for the Moonbase Alpha wayfarers. I have yet to read any of these - I didn't get them as a kid, and only recently started collecting these later volumes - but I look forward to diving in soon. I believe that all of these books - as well as a number of new novels - have been reprinted in recent years by a company called Powys Media. I don't have any of those books, and, frankly, I don't have much interest in them. I prefer to stick with the 70s originals. At the moment, I'm still missing Alien Seed and Rogue Planet... but I should have them soon. Then, I can work on getting all of the Year Two novels from Warner Books! It's Poll time again! 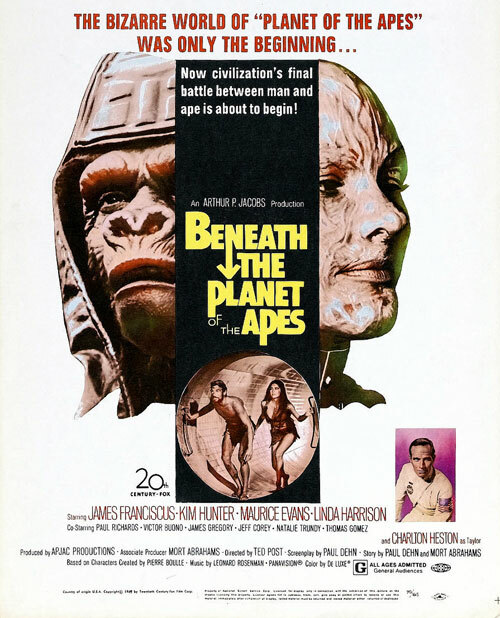 For this one, we're dealing with the first great sci-fi film franchise of the Seventies: 20th Century Fox's time-twisting Planet Of The Apes cinematic saga. 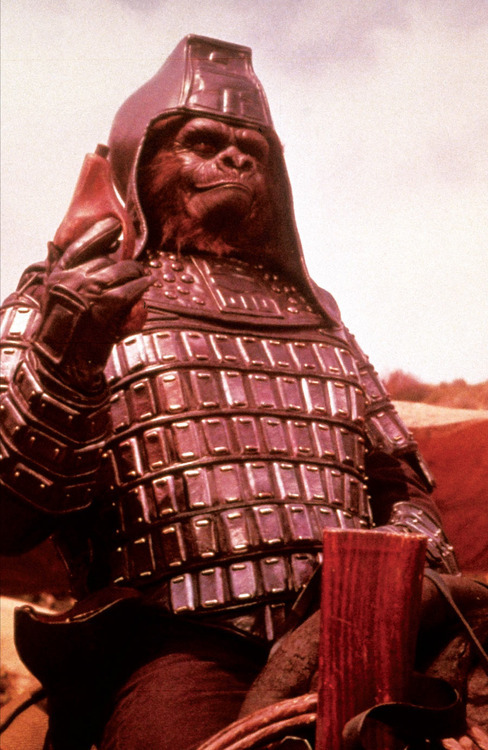 The question is a simple one: "Which Planet Of The Apes Film Is Your Favorite?" 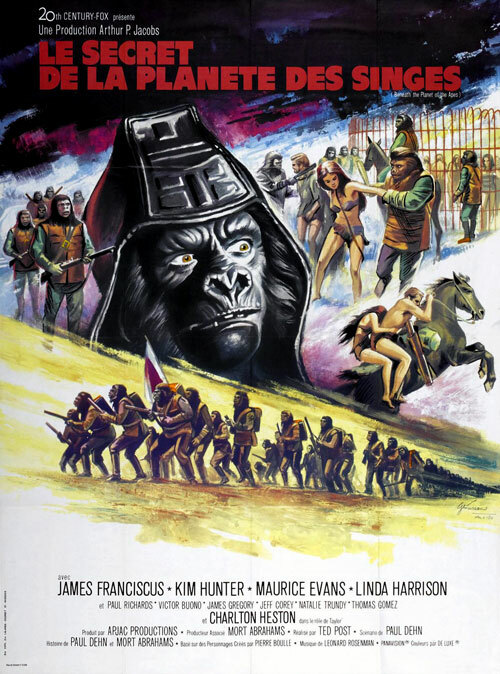 Just for the hell of it - and for completion's sake - I included Tim Burton's 2001 remake and 2011's re-imagined prequel, Rise Of The Planet Of The Apes, even though, technically speaking, they fall outside the purview of this blog. Personally, I'm expecting the 1968 original to win in a landslide... but I'm willing to be surprised. You'll find the Poll (as usual) over at the top of the right-hand sidebar, so vote now! As always, feel free (hell, I encourage you) to discuss and elaborate on your choices in the comments! There's really no such thing as lobby cards anymore. Nowadays theaters have ugly Photoshopped movie posters in backlit frames and gargantuan cardboard displays to preview forthcoming releases. But in the days when you bought your tickets from a boxoffice out in front, many theaters displayed these now-anachronistic cards in their lobbies along with exquisitely-painted one-sheets. I like posting scans of these cards here not only because they often feature lesser-seen photos from familiar films, but also because they're yet another lost aspect of the 70s Star Kid experience. 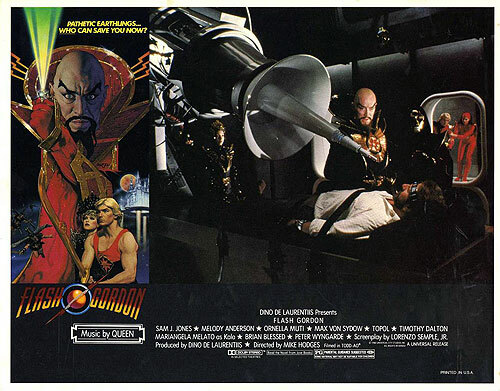 Today I've got a handful of lobby cards from Mike Hodges' 1980 Flash Gordon feature film, which, as loyal Space: 1970 readers know, is a great favorite of mine. I hope you enjoy them! 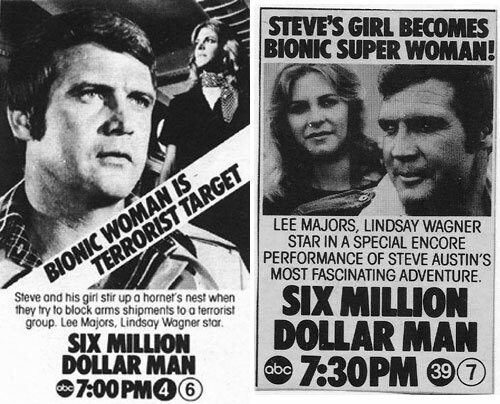 It's kind of interesting that the producer who dominated sci-fi television programming in the Sixties couldn't seem to get a genre show on the air in the following decade. 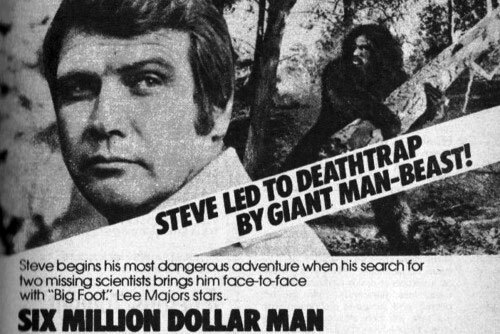 Prolific producer Irwin Allen, whose creations Lost In Space, Voyage To The Bottom Of The Sea, Time Tunnel, and Land Of The Giants were staples of late-60s network TV, found his particular brand of genre fare out of step in the 1970s. 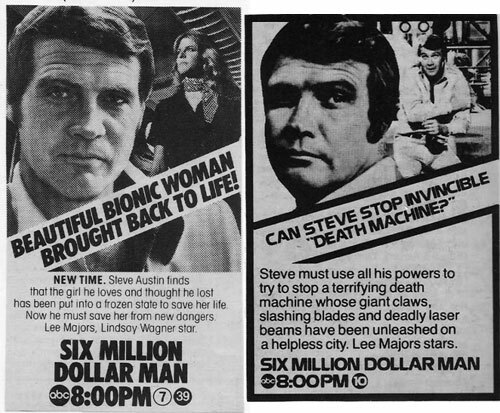 Like Gene Roddenberry, he pitched a few sci-fi pilots that aired as TV movies, but none of them went to series. Among these failed attempts were 1976's Time Travelers, 1978's The Amazing Captain Nemo, and 1971's City Beneath The Sea. 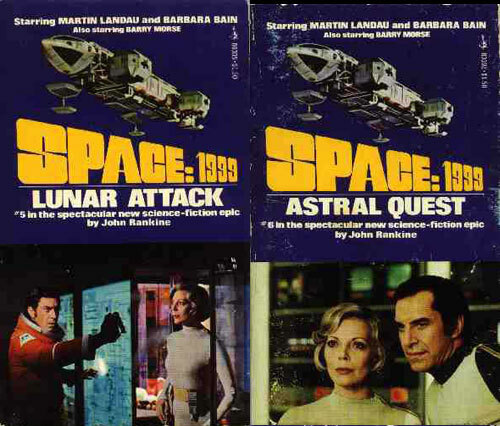 Stuart Whitman is Admiral Michael Matthews, who is ordered by the President of the United States to retake command of Pacifica, a large, underwater scientific research facility. Upon his arrival at the city beneath the sea, he is besieged by crises, including sabotage, espionage, various disgruntled colleagues, and a rogue comet that is going to collide with Earth right above his sub-oceanic seabase! In addition, Pacifica is in the process of receiving the U.S.' entire gold reserve from Fort Knox (shipped by rocket!) 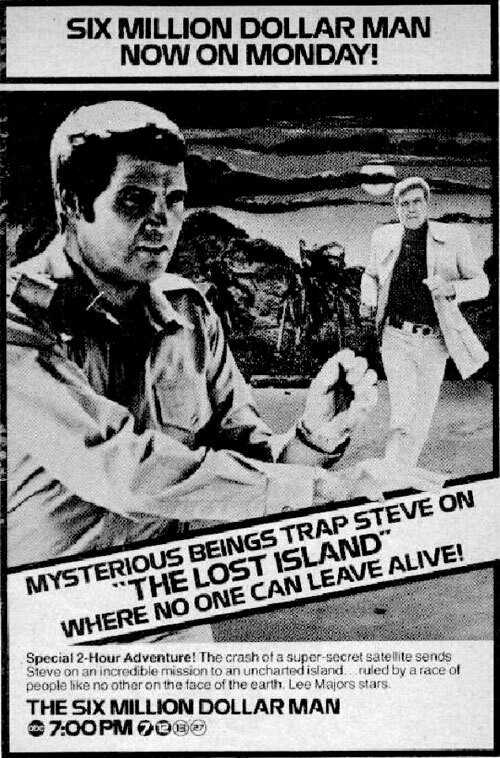 and a group of thieves (including Matthews' own brother - played by Robert Wagner) have an elaborate scheme in place for stealing all of it! 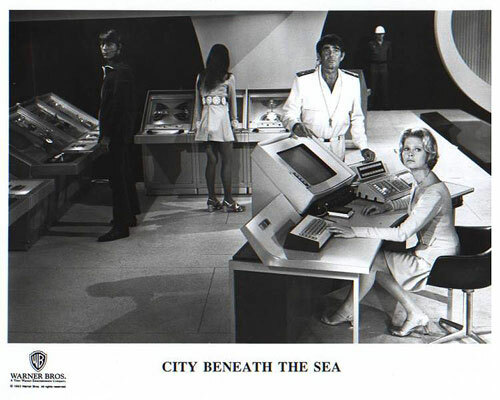 City Beneath The Sea is vintage Allen, with the same Cold War-tinged plotting, colorful production design, and Old School miniature effects that had been the hallmarks of his 60s productions; in fact, he re-used some of the models and sets from his earlier shows (most notably, Voyage To The Bottom Of The Sea's "flying sub"). A lot of familiar faces from those shows appear, too - James Darren, Robert Colbert and Whit Bissell from Time Tunnel and Richard Basehart from Voyage, among others. 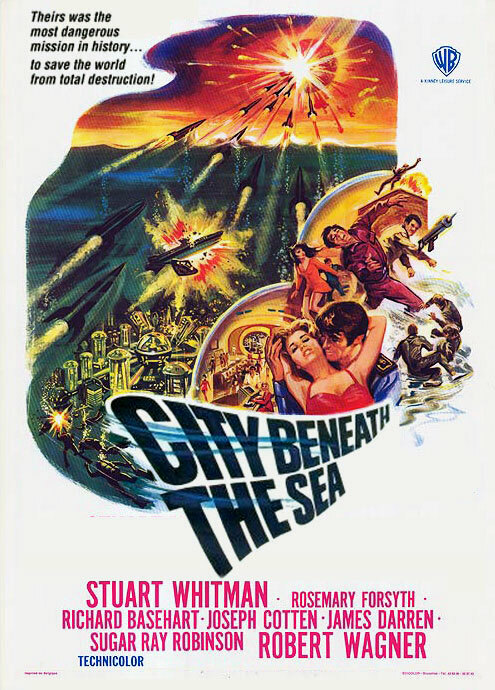 I don't recall seeing City Beneath The Sea on television in '71 (I was only six), nor did I catch it on TV in the years between then and now. 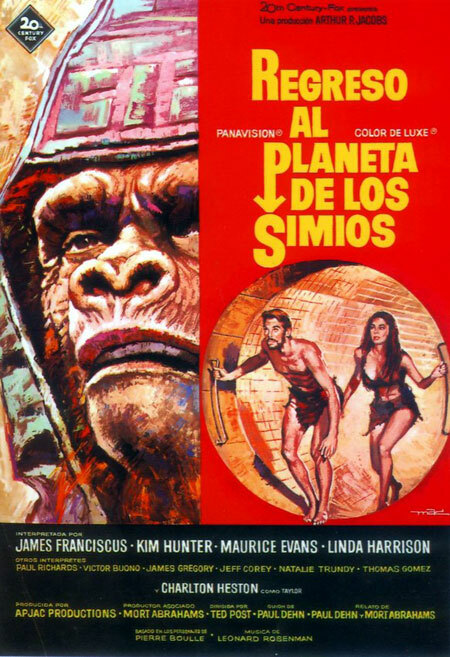 Fortunately for me, it is available as part of the Warner Archive Collection, both as a manufactured-on-demand DVD and on their online streaming service, which is where I finally caught up with it. 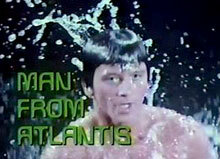 I enjoyed it considerably (as you probably guessed), but then, I'm a big fan of the Voyage to The Bottom Of The Sea series and Allen's other 60s shows. 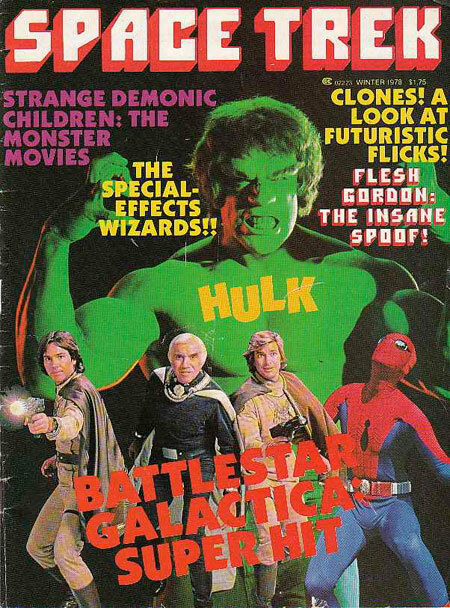 I'll definitely be adding the DVD to my 70s sci-fi library one of these days. 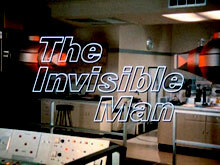 As for Irwin Allen, he may not have sold City Beneath The Sea as a weekly series, but he continued to do pretty well as a producer of theatrical films (and TV movies) during the decade, becoming the king of 70s disaster epics, with such hits as The Poseidon Adventure, The Towering Inferno, The Swarm, and others. 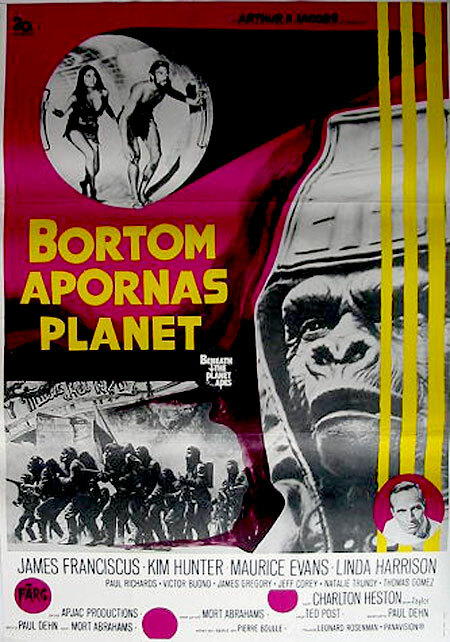 Today I've got a selection of colorful one-sheets from around the world used to advertise the first Planet Of the Apes theatrical sequel in 1970. 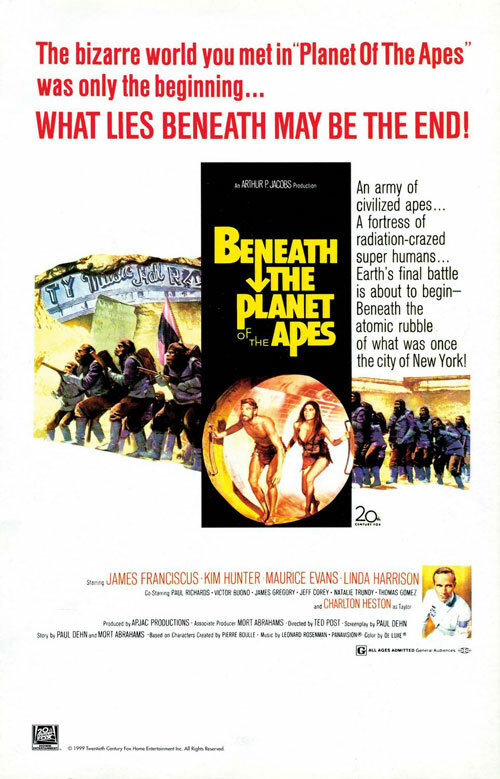 For a long time, Beneath The Planet Of the Apes was my favorite of the Apes sequels (these days, it keeps going back-and-forth between Beneath and Conquest) for its exciting action-oriented - and utterly nihilistic - bonkers plot. 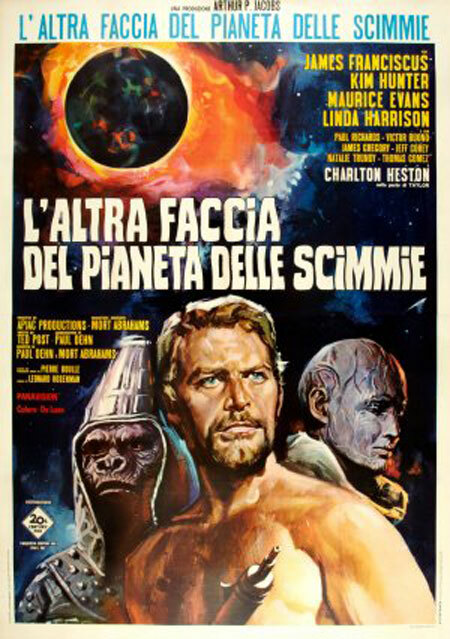 Plus, you know, telepathic mutants, lots of Linda Harrison's "Nova" - and one of the most downbeat endings in sci-fi cinema history. 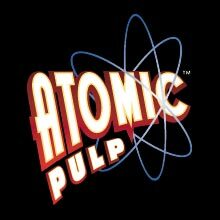 Not a lot new to report here; still buried in my comics writing commitments (including the Perils On Planet X webcomic), and still trying to carve out some time to finish up some longer posts. So, in short... new stuff on the way; stay tuned. • It's possible that I'm simply not looking in the right places or that my Google-fu isn't as strong as I think, but I've been trying unsuccessfully to find a complete list of the Space: 1999 paperbacks published in the U.S. by Pocket Books (Year 1) and Warner Books (Year 2) online. Now that I have a (nearly) complete set of Battlestar Galactica (I'm still missing one volume - haven't found an affordable copy of # 9 yet) and Man From Atlantis novels, I'm now concentrating on filling in the gaps of my Space: 1999 library. I'm not particularly interested in the Powys Media re-issues, or any modern/new novels; at the moment, I'm focusing on the 70s U.S. volumes. If anyone can direct me to a complete list, I'd appreciate it. 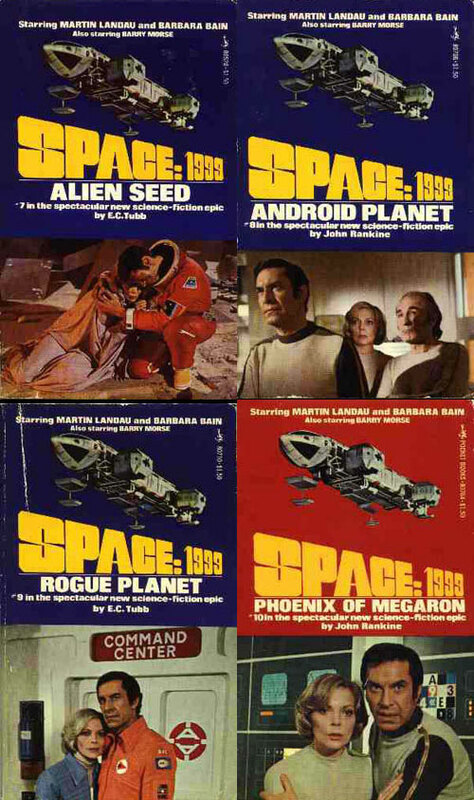 • The Space: 1970 blog has seen huge amounts of traffic lately, due mostly to my post on that unused Star Wars poster art, which garnered links from a number of high-profile sci-fi fansites and on Reddit. 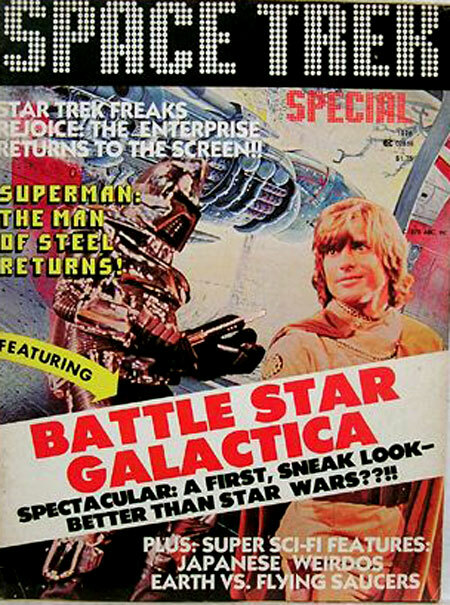 The Star Wars Burger Chef commercial has proven popular, too. I only hope that some of these new visitors take a few minutes to explore the rest of the blog and maybe become regular followers. 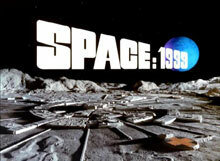 In related news, the Space: 1970 Facebook page now has nearly 1400 "Likes." Cool! The more Star Kids, the better! • Blatant Cross-Promotion: I want to remind you all again that my weekly sci-fantasy webcomic, Perils On Planet X, drawn by the talented Gene Gonazles, can be read for free at perilsonplanetx.com. This serialized interplanetary swashbuckler has a new page posted every Friday, and chronicles the adventures of modern-day Earth astronaut Donovan Hawke, stranded on the lost planet of Xylos, hundreds of millions of years in the past. 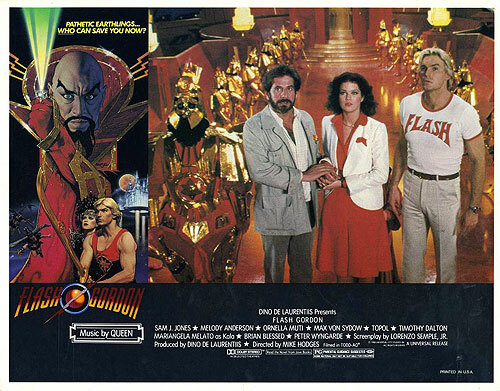 The story is packed with monsters, beautiful women and lots of Flash Gordon/Buck Rogers-styled thrills. I hope you'll check it out, bookmark it, and follow the comic each week. One of the most popular posts on this blog has been the one about the Star Wars Burger Chef/Burger King posters painted by Del Nichols and offered by both restaurant chains back in the early months of 1978. Well, here's a vintage Burger Chef commercial for those highly collectible fast food premiums, starring pitchdroids C-3PO, R2-D2, and some of their galactic "pals." 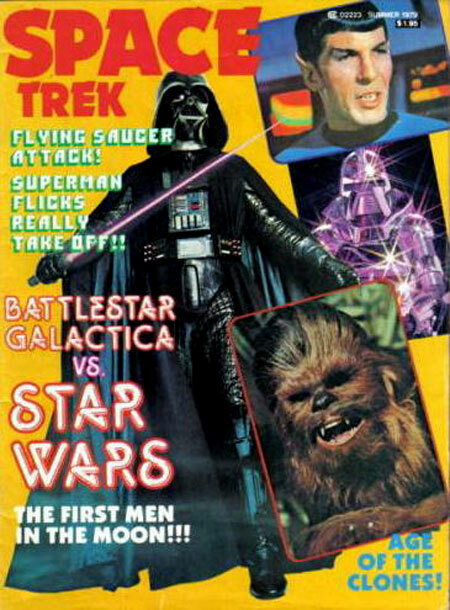 Yet another unimaginatively-titled genre mag from the publishing house behind such publications as Space Wars, Star Encounters, Star Battles and Star Warp, Myron Fass' Stories Layouts and Press Incorporated: the short-lived and confusingly-numbered Space Trek magazine from 1978. The eccentric Fass, who passed away in 2006, was a notorious publisher of low-end magazines and comics, the print equivalent of an exploitation film mogul, publishing anything and everything he thought might make a few bucks, especially if it appealed to the basest of tastes or could ride the coattails of some pre-established moneymaker. 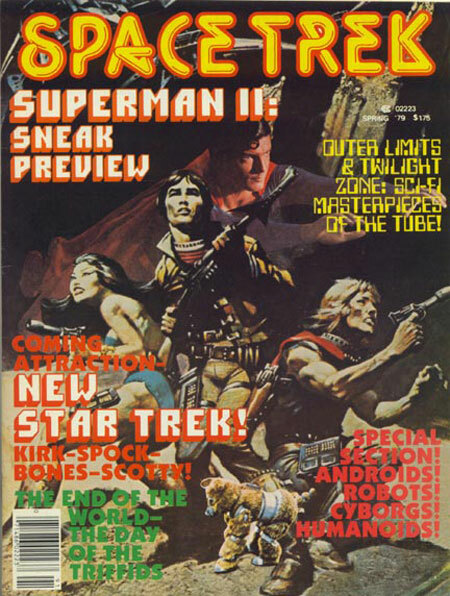 As with it's corporate brethren, Space Trek was a cheapo Starlog knock-off, indistinguishable from Fass' other scifi mags, complete with recycled stories, B&W photos and fan art, haphazardly assembled and rushed to press by the bottom-feeding publisher to separate young, starstruck Star Kids from their allowances while the genre was still hot. How many of these did you buy? 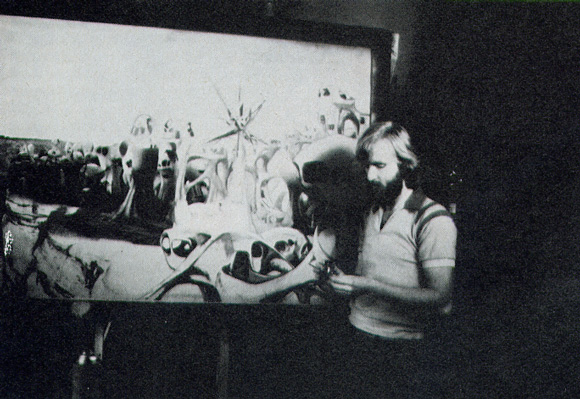 A young James Cameron works on a matte painting of the Akira village from Roger Corman's 1980 epic space opera, Battle Beyond The Stars. 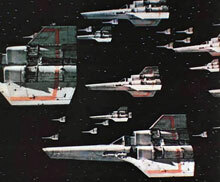 The multi-talented, future Academy Award-winning director Cameron handled a number of special effects and design duties on the film, including designing and building the main starship, Nell. June's Space Babe is pretty, pouty Ayshea, as SHADO Operative... "Ayshea," on Gerry Anderson's first live-action sci-fi series, UFO. 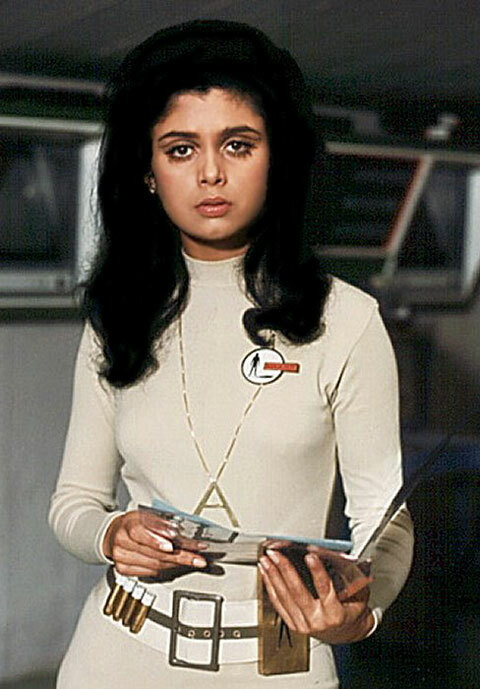 A fixture of SHADO's underground HQ beneath England's Harlington-Straker film studio, the raven-haired lovely with the prominent monogrammed pendant seemed to be one of the organization's most efficient and appreciated operatives. 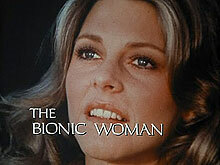 At least, Straker seemed fond of her. Actress and singer Ayshea Brough was born Ayshea Hague in 1948, and had her first film role at age 9. She was a popular recording artist and TV presenter in England the 70s, hosting such music and variety shows as Discotheque and Lift Off before moving to Los Angeles for most of the 80s and early 90s. According to online sources, she was a well known Beverly Hills socialite and ran a property development and interior design business. She returned to the UK in 1993.